Delivery only. Not valid with other coupons, discounts or promotions. Coupon only valid at Jerry's Subs & Pizza in Aspen Hill Shopping Center. ONLINE PROMO CODE: 4515104 One coupon per customer. With Valpak® coupon only. Coupon void if altered. Expires 05/04/2019. Additional cost for grilled chicken or extra toppings. Not valid on Mama Mia pizza. Not valid with other coupons, discounts or promotions. Coupon only valid at Jerry's Subs & Pizza in Aspen Hill Shopping Center. ONLINE PROMO CODE: ZLGPDZW One coupon per customer. With Valpak® coupon only. Coupon void if altered. Expires 05/04/2019. Not valid with other coupons, discounts or promotions. Coupon only valid at Jerry's Subs & Pizza in Aspen Hill Shopping Center. ONLINE PROMO CODE: CLCHSTK6 One coupon per customer. With Valpak® coupon only. Coupon void if altered. Expires 05/04/2019. Since 1954, Jerry’s Subs & Pizza in Silver Spring, MD has been creating the best overstuffed, hot and cold subs, including Jerry’s Famous Cheesesteak with his own secret marinade sauce. We also serve delicious, made-fresh-daily, homemade NY Style pizza for residents and visitors alike and they keep coming back for more. Whether you’re seeking subs, pizzas, crispy green salads or a catered party tray, we can help you make your next tailgate gig or home party exceptional with our foods. Dine in, order online or call to pick up an order; use our discount coupons and save on our foods. Dine In, Order Online, Order Via Mobile, Call In to Pick Up & Go. 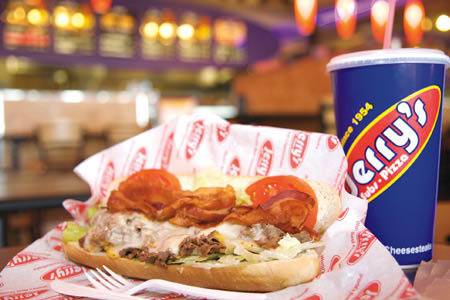 The World's Best Cheesesteaks, XTreme Cheesesteaks, Hot & Cold Subs, New York Style Pizza, Crispy Fresh Salads, Fresh Burgers & Cheeseburgers. Jerry's Subs and Pizza is conveniently located in Silver Spring, MD and is easily reached from the nearby communities of Washington DC, Reston, Potomac, Fairfax and other surrounding Maryland cities nearby.